It has been said that Igor Ivanovich Sikorsky achieved distinction in three separate careers, all in the field of aviation. He created the world's first multi-engine airplane in Russia in 1913; he launched a second career in theUnited States and became famous for his Flying Clippers; lastly, he conceived and developed the world's first practical helicopter. He is best known, perhaps, for this third career. He was born in Kiev, Russia, on May 25, 1889. As a boy, influenced by his mother, a medical school graduate, and his father, a doctor and a psychology professor, he showed an interest in science, particularly aviation. He built and flew model aircraft; he became acquainted at an early age with Leonardo da Vinci's theory of the flying screw. He was 14 when Wilbur and Orville Wright made their historic flight at Kitty Hawk, North Carolina, and that event, more than any other, decided his career. He spent three years at the Naval College in St. Petersburg, and was still a student at the Mechanical Engineering College of the Polytechnic Institute in Kiev when he determined to build his first helicopter. He traveled to Paris, then the aeronautical center of Europe, where he met some of the early names in aviation, men like Louis Bleriot, first to fly the English Channel, before returning home with a 25 horsepower Anzani engine. He built his first helicopter in 1909, his second in 1910. The second accomplished what the first did not -- it proved able to lift itself -but it was unable to sustain the weight of a pilot. Mr. Sikorsky turned to fixed-wing planes and, in 1910 made his first solo in an aircraft of his own design and construction. His approach was practical; he made-sketches of the plane he wanted to build, built it, then trained himself to handle it, correcting his errors as a pilot as he corrected errors in design. He defied the experts of that early period by building the first four-engine airplane in 1913. The plane, called The Grand, included such luxuries as an enclosed cabin, a washroom, upholstered chairs, and an exterior balcony for passengers. The Grand was followed by a larger aircraft, called the Ilia Mourometz, after a legendary Russian hero of the 10th Century, which, in a military version, proved highly successful as a bomber in World War I. More than 70 of these bombers were built. The Revolution ended Mr. Sikorsky's career in Russian aviation. He traveled to the United States in 1919, after short stays in England and France. Lectures to Russian immigrant groups gave him money for room and food, while he dreamed of new conquests of the air. America had been a beacon to him. "As a youth, I was impressed by the skyscrapers that were taller than anywhere else," he recalled in 1967, "by the railroad system that included more miles of rails than the total of the rest of the world. I was inspired by the achievements of such men as Edison, Ford, and others, and in my case particularly, the Wright Brothers." In 1923, he organized the Sikorsky Aero Engineering Corporation on a farm near Roosevelt Field on Long Island. The first aircraft built was the S-29-A, the A for America, a successful twin-engine, all-metal transport. A number of other aircraft followed, including the S-38 amphibian which Pan American Airways used to blaze new air trails to Central and South America. Mr. Sikorsky's company became a division of United Aircraft Corporation in 1929, and the combination gave aviation a series of historic flying boats. The first 40-passenger Flying Clippers were built in 1931, followed by the first transoceanic flying boat, the S-42, which pioneered commercial air transportation across the Pacific and Atlantic. By 1938, the pioneering of oceans was over, and Sikorsky returned seriously to the field of vertical lift. Through the years, he had kept notes on ideas for helicopter designs. His first helicopter, the VS-300, was begun in early 1939 at the Vought Sikorsky plant in Stratford, Connecticut by fall, it was completed, a strange-looking tubular skeleton which rose a few feet from the ground on September 14, 1939. The VS-300, in point of time, actually dates back to 1929 when Mr. Sikorsky concluded that a successful helicopter soon would be possible. In 1931 he applied for a helicopter patent that incorporated most of the features of the VS-300. There was one main lifting screw and a small auxiliary rotor at the rear of the fuselage to counteract torque. The VS-300 was powered by a four-cylinder, 75-horsepower, air-cooled engine it had a three-bladed main rotor, 28 feet in diameter, and a welded steel frame, a power transmission combination of v-belts and bevel gears, a two-wheeled landing gear, and a completely open pilot's seat. The VS-300, now part of the Ford Museum at Dearborn, Michigan, established a world endurance record by staying aloft an hour and 32 minutes on May 6, 1941. Thus, the helicopter fundamentals were established. There was a period of evolution in the VS-300. Mr. Sikorsky tried 19 different configurations before he was satisfied with the final design. Military contracts followed, and in 1943 large-scale manufacture of the R-4 made it the world's first production helicopter. Public acceptance of this strange new vehicle, however, was far from immediate. The helicopter had to prove itself. It did just that in the Korean War, serving as a troop transport and rescue aircraft; men injured in combat were flown directly to field hospitals, their chances of recovery greatly enhanced. Mr. Sikorsky saw the helicopter as a vehicle that freed aviation from dependence on airports. The helicopter's ability to take off and land vertically was a breakthrough long dreamed by engineers, but never fully realized until Mr. Sikorsky launched his third career. The helicopter gradually established its versatility in peace and war, but Mr. Sikorsky himself found the greatest satisfaction in the knowledge that helicopters were responsible for saving tens of thousands of lives as rescue aircraft. Pilots of rescue helicopters have contributed "one of the most glorious pages in the history of human flight," he said in 1967. "It is to these gallant airmen that I address my thankfulness, respect, and admiration," he said. A deeply religious man, Mr. Sikorsky wrote two books called "The Message of the Lord's Prayer" and "The Invisible Encounter." In summation of his beliefs, in the latter he wrote: "Our concerns sink into insignificance when compared with the eternal value of human personality -- a potential child of God which is destined to triumph over lie, pain, and death. No one can take this sublime meaning of life away from us, and this is the one thing that matters." 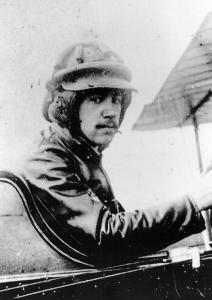 He also wrote an autobiographical account of his life in aviation called "The Story of the Winged S."
His contributions to aviation brought him many honors and awards. In 1952, Thomas K. Finletter, then Secretary of the Air Force, presented Mr. Sikorsky with the National Defense Transportation Award and said: "He is a milestone in the history of aviation, an equal giant and pioneer. Look upon him well and remember him." In 1966, Mr. Sikorsky was named Man of the Year by the Air Force Association. Congratulating him on the award, President Lyndon B. Johnson said: "Your skill and perseverance have broadened the horizons of man's progress." In 1967, accepting the Wright Brothers Memorial Trophy of the National Aeronautical Association, Mr. Sikorsky expressed his belief in the importance of the individual, a belief that carried him stubbornly past frustrations and failures to success in his three careers. "Creative work is still with us," he said, "still here to stay, and still remains a tremendously vital factor in the progress of mankind. The work of the individual still remains the spark which moves mankind ahead."